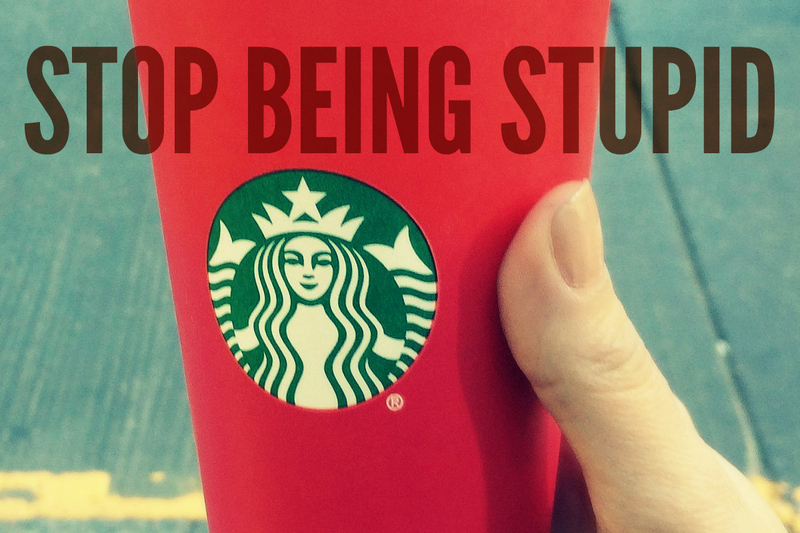 Relate: About two weeks back I wrote a post titled Don’t Be Stupid. The key verse for the post was 2 Timothy 2:23 which reads: “Again I say, don’t get involved in foolish, ignorant arguments that only start fights.” I then wrote about how we have a tendency to use our social media platforms for the stupidest reasons and to argue about the dumbest things. In such arguments there is no winner and it only hurts all involved. React: If those engaging in such stupid debates were only wasting their own time, I probably wouldn’t really care much. Everyone should have a hobby and if certain people chose to make idiots of themselves in the public arena as their hobby, more power to them. The problem is, it detracts from those who are actually trying to be about the Kingdom business. Even here, half a world away, in a Muslim country where Christmas is practically a nonfactor, I have had someone ask me why Christians are so mad at Starbucks. Here I am trying to share the love of Christ with my neighbors and you fools are stirring up a furor that reinforces the negative stereotypes they have about Christianity that I am trying to break down. You children, please be wise, that I might better answer my critics. Please, please, stop being so stupid. This is perfect. As a lady, I was thought certain social descourses to ingage; no politics, no religion and no genderous remarks. We each have an opinion but it is not for us to punish another for theirs. We live for ours and lead by example. Thanks for sharing, as ever Solitaire. I got off of Facebook a while back out of obedience to my Lord, but also because it was filled with so much junk, much of which was coming from those who profess the name of Jesus. I found myself weeding through mounds of junk just to try to find a nugget of something worthwhile here or there, but there wasn’t much. The Lord told me to get off, so that is what I did. And, I have no desire to go back. I’m with you. I use facebook because messenger makes for cheap & easy international chatting with friends and family. Besides that, it’s a waste of time. I haven’t had a TV since moving here and 90% of the time back in the states I didn’t even bother keeping it plugged in. Thank you. I appreciate you sharing that with me. Cfservant, I also deactivated from fb in February at Lord’s direction. It wasn’t easy but I pretty much saw it coming. There is little to nothing to watch on TV (other than GEB channels). So it’s blog or memoir writing & listening to CCM. Now that I’m basically off twitter & not much involved with Periscope – phone is pretty quiet. A pleasant change! easier to read The Word now, too! Absolutely! Satan wants to keep us distracted all the time so we don’t have time for God, his word, and for his service. No TV freed up a bunch of time for us, and so did no Facebook. Yes, a very pleasant change. Amen! You are not alone. I have told quite a few that the very businesses they are boycotting are the very businesses that employ many Christian workers. Stupid is as stupid does. But I’m feeling you! This is foolish I haven’t bothered to address it because apparently, when people get bored, like frustrated children–they do stupid. I was sold from the title of your message! I agree with your points, and it saddens me to see believers deceived by the plan of the enemy to distract us and to tarnish the credibility of Christians worldwide. You keep fighting to be the change, so will I and we can change the world one heart at a time! You are not alone, and there are true Christians in the world and using social media to proclaim and demonstrate the love of Christ. Our church has been dealing with some issues over the past few weeks that have served little but to distract us from the mission of reaching the lost. Vain arguments are designed to pull us back into the physical battles and draw our attention off of the spiritual war. Satan is defeated when we attack him in the Spirit, but we are divided and defeated when we try to battle him in the flesh through arguments. Be encouraged! Keep up the great posts! Sometimes people choose the wrong “hill to die on.” I understand that people are angry about the constant efforts to snuff out Christianity, but we have to pick the right hills on which to make our stand. I agree. One of my husband’s aunts was ranting about it on facebook. “first they support planned parenthood and now this”. Then her friend writes, “I won’t be drinking their coffee any longer!” That will show ’em. eye roll. very well said BJ. Thank you! Because of the recent outcry by Christians towards Starbucks’ new holiday cups, I think it is giving a bad image to myself. I have, unfortunately, I suppose, been boycotting Starbucks for awhile now, but not over the cups issue. I worked for the company earlier this year, and had the worst experience on the co-worker and management level, as well as the corporation as a whole. I have shared with many my experiences, though I think that people may see me as being a bigoted Christian because they may see my reaction to the company targeted just by my Christian beliefs. What do you think, friends? It is a shame to see the term ‘Christmas’ slowly becoming an offense on the state-side, but you are right, BH. There are such larger issues than how a company chooses to market. In today’s society, so many people become offended by the stupidest things. I feel like people are trying to claim themselves as victims, though they are criticizing and being hurtful to other groups, Christians and non-Christians alike. It’s become a constant circle of hypocrisy. I choose not to shop at Starbucks due to past experiences, and also because I work for a local coffee company (so I feel like I’m cheating on my own employer haha). However, as Christians, we need to love on those baristas that take the brunt of this criticism because it is not their fault. Maybe they would prefer to say Merry Christmas too. Or maybe they don’t celebrate. Either way, each is entitled to his or her own opinion, and as Christians, what we need to focus on the most is to show the love of Jesus to EVERYONE. Lol! Actually I think it is two things going on, as I tend to be a bit of a conspiracy theorist. 1. It is the obvious nut cases that call themselves Christians but have never read the Bible, just hearsay knowledge ie, televangelists, etc. However, they are being used by the enemy to distract and alienate those who are considering Christ. I mean really, why be angry? The cup is red! I found it to be a cool marketing technique to celebrate the Blood of Jesus. 2. Starbucks marketing gurus who knew crazy Christians are out there and it gives them a way to be marketed to people who have not ventured into their stores for a $5 cup of coffee! Smart business. That which we focus on gets the most energy. People in the UK massively botcott Starbucks, but for a good reason. They don’t pay tax here! I’m mostly off social media, but I initially saw this story on flipboard mag. I had to stop drinking coffee (even decaf) awhile ago. The “issue” shouldn’t be the color or what’s missing from the cup “decoration.” If you’re breathing, you’ve got a purpose. Find it & leave the “dust” of these temporary distractions by the side of the road. We can’t take coffee to heaven with us, but the souls we introduce to the scripture will b changed by the Holy Spirit. First of all a great title ..a very cool post . Hi. I love this article. We must never forget that our first assignment as Christians is to love!! !